You've now added Times Square to your itinerary. Visiting Cupsogue Beach County Park and Joel L. Lefkowitz Park at West Meadow Beach will get you outdoors. You'll get in some beach time at Point Lookout Beach and Lido Beach. There's more to do: enjoy breathtaking views from Empire State Building and settle in for a delightful tour with a horse-drawn carriage tour. To see maps, ratings, where to stay, and other tourist information, read New York City trip planner . If you are flying in from Denmark, the closest major airports are La Guardia Airport, Newark Liberty International Airport and John F Kennedy International Airport. In August, plan for daily highs up to 34°C, and evening lows to 25°C. Cap off your sightseeing on the 18th (Sun) early enough to catch the train to Philadelphia. Kick off your visit on the 18th (Sun): trek along Schuylkill River Trail, take in the history at Valley Forge National Historical Park, and then admire the local landmark of Longwood Gardens. Get ready for a full day of sightseeing on the next day: admire nature's wide array of creatures at Philadelphia Zoo, then contemplate the long history of Independence Hall, then explore the striking landscape of Independence National Historical Park, and finally don't miss a visit to Liberty Bell Center. For photos and other tourist information, read Philadelphia online journey planner . You can take a train from New York City to Philadelphia in 2 hours. Other options are to drive; or take a bus. August in Philadelphia sees daily highs of 34°C and lows of 24°C at night. Finish up your sightseeing early on the 20th (Tue) so you can catch the train to Baltimore. On the 20th (Tue), explore and take pictures at Oriole Park at Camden Yards, admire the architecture and history at Fort McHenry National Monument, and then take a stroll through Inner Harbor. To find where to stay, other places to visit, traveler tips, and more tourist information, use the Baltimore road trip app . Take a train from Philadelphia to Baltimore in 1.5 hours. Alternatively, you can drive; or take a bus. In August in Baltimore, expect temperatures between 35°C during the day and 25°C at night. On the 21st (Wed), you'll have the morning to explore before heading off to Washington DC. 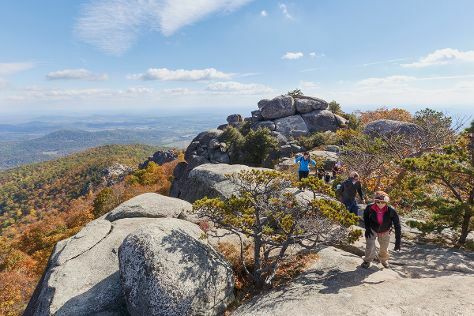 Get in touch with nature at Old Rag Mountain Hike and National Zoological Park. When in Washington DC, make a side trip to see Copper Fox Distillery in Sperryville, approximately 1h 45 min away. Next up on the itinerary: examine the collection at National Air and Space Museum, wander the streets of Georgetown, appreciate the history behind Jefferson Memorial, and admire the masterpieces at National Gallery of Art. To see traveler tips, where to stay, and tourist information, read Washington DC driving holiday planning tool . Getting from Baltimore to Washington DC by train takes about an hour. Other options: drive; or take a bus. In August, daytime highs in Washington DC are 36°C, while nighttime lows are 25°C. Wrap up your sightseeing on the 24th (Sat) to allow time to travel to Miami. Visit South Beach and Fort Lauderdale Beach for some beach relaxation. Escape the urban bustle at Shark Valley and Speed Boats Tours. When in Miami, make a side trip to see Hollywood Beach in Hollywood, approximately 40 minutes away. The adventure continues: take a stroll through Lincoln Road, make a trip to Ocean Drive, get a taste of the local shopping with Bayside Marketplace, and take in the architecture and atmosphere at Saint Francis de Sales Catholic Church. To find photos, maps, ratings, and more tourist information, read our Miami route builder site . Traveling by flight from Washington DC to Miami takes 4.5 hours. Alternatively, you can do a combination of train and flight; or drive. Traveling from Washington DC in August, you can expect nighttime temperatures to be a bit warmer in Miami, with lows of 30°C. You will have some time to spend on the 28th (Wed) before leaving for home.